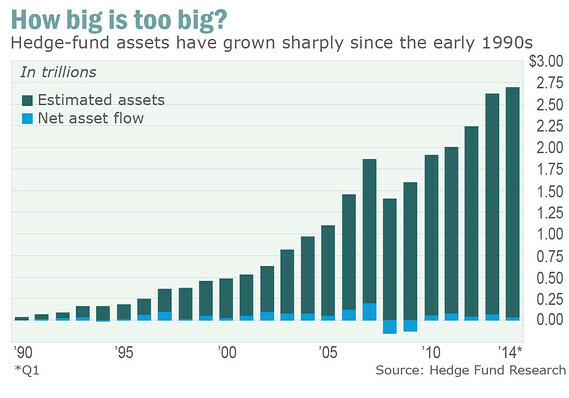 The hedge fund industry continued to grow in 2014. According to data provider HFR, assets under management have grown by 8.2 percent to reach a new record high of USD 2.85 trn. As traditional asset classes are becoming increasingly expensive, investors are looking to hedge funds for a reasonably stable performance. However, we think that the return prospects for the industry have deteriorated, partly due to market factors and partly due to structural factors. We would expect annual returns of 4 percent – 6 percent for hedge funds as measured by the Credit Suisse Hedge Fund Index. We have turned positive on tactical trading strategies, which are now our preferred style, followed by fundamental strategies. Tactical trading, which includes global macro and managed futures, should benefit from higher volatility levels in 2015 compared to 2013/2014. Furthermore, divergences in growth and monetary policy developments, the expected continuation of currency trends in USD, EUR and JPY, as well as lower correlations across asset classes, should create trading opportunities for this style. Generally, tactical trading strategies tend to be more resilient to difficult market conditions than fundamental or relative value strategies. Unlike for other strategies, higher volatility and low liquidity is not necessarily a negative for tactical trading strategies. In fact, managed futures have outperformed Treasuries in times of equity market corrections (see chart). Although a crisis scenario is not our base case for 2015, we still foresee conditions becoming more conducive for tactical trading strategies. We retain a positive bias toward fundamental strategies, although the broad market environment for this style has deteriorated. A combination of lower return prospects and strategy-specific factors are driving our view. Within this style, we prefer long-short equity and merger arbitrage within fundamental strategies. We recommend being more selective when it comes to distressed debt and emerging markets managers. Relative value is our least preferred of the three styles, mainly due to the more challenging liquidity environment. While we continue to see upside for the equity market neutral strategy, reduced liquidity poses a bigger threat for fixed income arbitrage and convertible arbitrage. With hedge fund indexes generally up low single digits, alternative investment strategies appear to be off to a strong, if somewhat correlated, start to the year. With the S&P 500 up 1.54 percent year to date, and the Barclay-Hedge Fund index up 2.14 percent, many Hedge Funds are rising with the stock market — including managed futures CTAs, which are up 5.57 percent year to date based on Barclay BTop50 investible CTA index. This performance comes despite changing market trends in late February that saw the oil price trend lower stall. It is a positive correlation to stocks when stock are rising that is acceptable. It is the point when negative price trends in the stock market persist that the real noncorrelated hedge fund talent might be identified. Highfields Capital Management, the $12 billion fund that has been closed to new investors in 2015, reported 3.3 percent performance in February after a negative January, according to a report in Bloomberg Briefs. The much-watch Harvard University Management Company alumni Jonathon Jacobson co-founded the hedge fund in 1998 with a reported $1.5 billion initial investment from the Ivy League school. The value investors posted low single digit returns last year, as value metrics didn’t discover much in the way of value. The fund has profited in every year since its founding, with the exception of two years. Another Harvard club member with positive 2015 performance is high yield bond hedge fund Regiment Capital Advisors, which Bloomberg reported was up 2.1 percent in February, coming off a 0.5 percent loss in January. The fund lost 8.8 percent in 2014, hurt by exposure in oil and various transportation-related debt offerings. The Dallas Police and Fire Pension is not likely ecstatic with Highland Capital Management, which is down 47 percent on its investment since investing $18 million in 2007. While many hedge funds survived the crash — and in fact some hedge fund strategies performed positively during the crash — Highland was not such a fund. One of the top performing fund as of February 28 was the Tiger Ratan Capital, the “Tiger Cub” fund operated by Nehal Chopra. The fund was up 19 percent, which shows the 34-year-old Chopra has been on her toes. With nearly 19 percent annualized performance and coming off 47 percent performance in 2013, the fund has been under scrutiny for its management issues. As previously reported in ValueWalk, the disciple of Tiger Management’s Julian Robertson has struggled to keep employees happy, with four chief financial officers and as many analysts leaving in five years. Sources quoted in the article cite Chopra’s management style as an issue along with skimpy benefits at the firm, including insurance, issues that are currently being addressed. Hedge fund performance could cure all ills as Chopra, who outpaced S&P 500 in February with 13 percent performance, is off to an undeniable strong start. Another strong performer year to date is Paulson Partners Enhanced program, up 9.3 percent. The performance comes as Paulson was reported on several occasions to have performance and redemption issues. The Paulson Special Situations Fund, which lost 2.6 percent year to date, had a profitable February, up 7.3 percent on the month, Bloomberg reported. In other hedge fund news, systematic trend follower Covenant Capital was down 1.63 percent in February as oil market price trends faltered, an investor performance document reviewed by ValueWalk revealed. Scot Billington’s fund was up 27 percent in 2014 and he had warned in the January investor letter that performance was “likely to end soon,” which is what happened in February. In January many quantitative fund managers noted that price persistence measures foretold a softening market environment for mid to long term trend followers. Covenant was previously profiled in ValueWalk and the podcast Wall Street Untiltered. The FORT Global Contrarian Program outperformed the NewedgeCTA Index by 0.11% in February while the Global Diversified Program outperformed by 0.32%. Firm assets under management are now in excess of $1.1 billion. Cem Karsan, founder and managing partner of volatility hedge fund AEGEA Capital Management’s Absolute Return Fund, was up 1.84 percent in February, following strong hedge fund performance of 2.84 percent performance in January. Another volatility hedge fund, The Core Vega Fund from Core Capital, was down -0.36 percent in February but is up 0.18 percent year to date.